An auteur is a filmmaker whose unique style, personal influence and artistic control of a film give the work its distinction. Over the years, it’s been much more common to see auteur creators in the world of independent film, but in an era of “Peak TV” and with an abundance of new scripted series to be consumed and platforms to be reached there are a whole lot of new creators taking the lead and putting their idiosyncratic stamp on small screen. During the closing night of Film Independent’s 2017 Directors Close-Up Series, the creators of three of today’s most acclaimed shows unraveled their journey in the TV medium. Moderated by Wendy Calhoun (writer, Empire, Nashville, Justified) the panel consisted of Crazy Ex-Girlfriend creative duo Rachel Bloom and Aline Brosh McKenna; Issa Rae, creator/writer/actor of the HBO series Insecure; and Pamela Adlon, writer/director/lead of the FX series Better Things. The panel showcased exactly what comprises this modern era of television: a diverse blend of old school executives teaming with new school DIY creators, many of whom went diretly from creating iPhone and/or web content to successful network deals. Beginning with the “birthing process”, Gen Y creators Rachel Bloom and Issa Rae described the artistic growth of their YouTube days. Rae began creating zero-budget iPhone videos with her friends, offering lunch in exchange for their services. 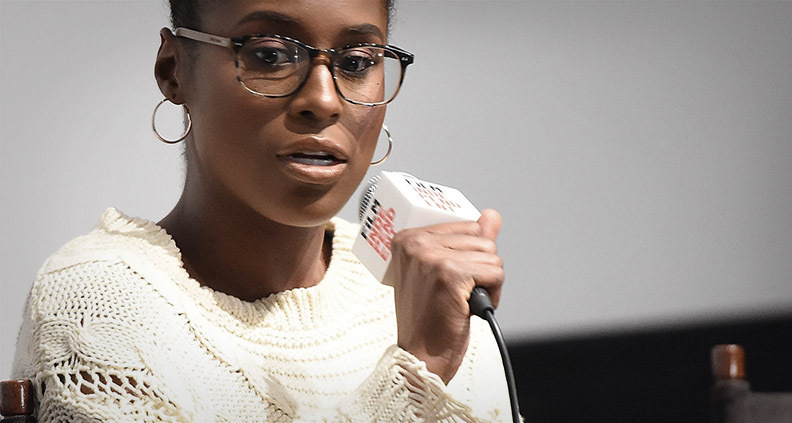 After growing into two different web series, conversations with producers and executives began speeding up, with her hit web series Misadventures of an Awkward Black Girl paving the way for her current HBO series Insecure. Bloom had a similar experience, though instead of a web series she opted for one-off musical comedy videos, including the cult classic music video “F**k me Ray Bradbury” which she pulled off with a minimal budget and the help of friends. The video caught the attention of many people, including an agent and future Crazy co-creator McKenna (The Devil Wears Prada), who liked Bloom’s writing and decided to reach out. Upon their initial meeting, the two clicked and began shaping the idea for Crazy Ex-Girlfriend. The panelists shed light on the process of finding and working with a creative partner. McKenna described how she felt Bloom’s amateur go-getter attitude complemented her own decades of experience in world of TV development. “She really thinks outside the box, because she hasn’t been kind of squeezed through those boxes that I know,” she said. Conversely, Rae spoke about the wisdom she received from successful comedian/writer Larry Wilmore, whom she said helped her hone the voice she already had and taught her how to defend it in an atmosphere of executives trying to shape the final product. For Adlon, Louie CK—whom she’d worked with previously on his own FX show—was the perfect writing partner. “Having a creative partner that you feel that comfortable with who can share your voice is amazing,” she said. In an era of television where creators like Bloom and Rae go from wearing a majority of the hats on their projects to delegating more production tasks, the Director role is often one of the first to be discussed. The process of finding not only a good director, but also one who will stay true to the voice of the story, is critical. 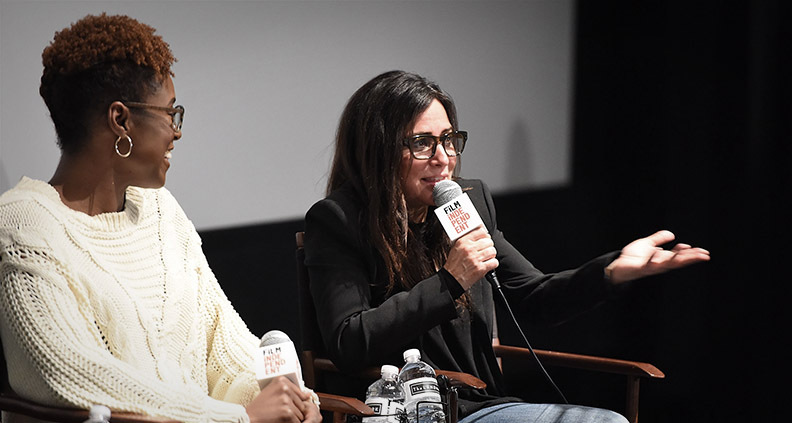 While McKenna confessed that the process of screening directors was very challenging, Bloom—who would like to direct in the future—noted, “getting another collaborative voice in there only makes it better”. On the other hand, Rae, who had directed college plays and her web series, has no desire to direct Insecure at the moment, being happy enough with the work at hand as writer and actor as well as being able to give notes in the editing room and help shape the final product. Though the panelists all have different backgrounds and stories, they agreed that Peak TV is letting creators create, allowing television to be more like film in how it provides more choices for storytellers to express themselves, ultimately benefitting a more diverse and realistic pool of stories. And for an extra bit of real-life advice on how to deal with a bad day, Adlon wrapped up the evening by offering some perspective on learning to laugh at obstacles and say: “bad for my life, great for my show”. To learn more about Film Independent’s Directors Close-Up click here. For more info about Film Independent, please visit our website or subscribe to our YouTube channel. Learn how to become a Member of Film Independent by clicking here.